2012 & our 36th Annual event! It's hard to believe that it's only mid-February and things are growing outside - I think spring is fast approaching! My bulbs are almost blooming, which feels a little early to me. I just wanted to post a reminder that our WIPC 36th Annual Horse Trials will be on July 6-8 this year. It's hard on the heels of the July 4th celebrations, which will make it hard to get some of our last minute preparations done, so we will need to be planning well ahead. We will be starting on grooming the course as soon as it looks like the weather has dried enough and the ground is solid, as we don't want to ruin the course with our vehicles! I'm sure our winter storms have caused some branches and/or trees to fall on the wooded parts of the site. So, if anyone is able and willing to use a chainsaw to cut up downed trees, etc., please let me know. If you do the work and want the wood - you are welcome to it for your effort. The site is secured so this needs to be arranged ahead for access. This sort of work can be done before other things that are needed on the course itself. Work will start in earnest in March and April, weather permitting. Please feel free to call any of us (see website for contact info) if you would like to help out on site preparations. We can ALWAYS use additional hands, backs, machinery and ideas. We will be running back-to-back one-day fun horse trials in September. Bring your horse for schooling on our fabulous event course. Great way to start a green horse or rider, or just keep your mount (and yourself) tuned. Opening date is August 19th (close 9/5). If entries warrant, we will run clinics only on Sunday, rather than horse trials. Entries will be posted on eventingscores.com. Or email us at wipc35@gmail.com. 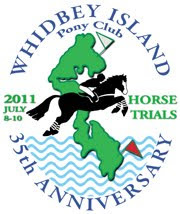 The Whidbey Island Pony Club Horse Trials are coming up very soon – this year they will be July 8, 9 and 10. Cross country will be run on Friday afternoon, July 8, from 3-5p and all day Saturday, July 9, from 8a-5p. These times are just approximate until we get our entries in and start times posted, but these are the normal schedules. We ALWAYS need help with jump judging and we ALWAYS have other jobs that need filling each of the event days. Our volunteers are essential to the running of this event and we would like to extend a huge thank you for helping us out! For instance, on Friday, during dressage, we will need ring stewards, bit checkers, score runners and traffic (people/spectator) control; on Friday afternoon, we will start Beginning Novice cross country at about 3p, which means we’ll need about 18 jump judges in place by 2:45 (check in at 2:30) and we’ll also need timers, warm-up/ring stewards, traffic control and water people. On Saturday – we’ll be duplicating Friday afternoon’s cross country shift for four more divisions/shifts and needing up to 26 jump judges for the upper level ones. Obviously, a lot of personnel is required! On Sunday, we do the stadium jumping and we run two rings from 9a to about 3p – they each require ring stewards, timers and warm-up people – not as labor intensive but everyone is so tired by then that it’s a great time for fresh bodies if Sunday is all that you have available. On Friday we need all volunteers for cross country to be on site and checked in by 2:30p for a 3p start. The first shift on Saturday is early – the first horse out is at 8a and we need to have everyone in place (at their jump with radio, scoresheets, etc in hand) and checked in (with the course controller) by 7:45a, which means you must present yourself to the jump judge station (me) by 7:30a latest. The next shift will be starting about 11a, then third at 12:30p, then last about 2p. The day finishes about 5p if all goes well. It’s important that you know what you’re doing and we provide schooling in jump judging on Thursday evening (July 7), 7p, at the concession stand at the course. If you haven’t done jump judging before, it would be important for you to attend this meeting, as it’s very difficult to give you training while trying to check everyone else in at the competition. Even if you’ve done it before, you should attend the meeting – there are often slight rule changes that need to be communicated to all. For most of the jobs you will need to bring a folding chair with you and make sure you have clothing appropriate to the weather (let’s pray for sun! ), as well as water and sun block. This is out in farmland, so we have to be prepared for the worst. If you are volunteering for more than one shift on Saturday, we will provide you with a box lunch. If you would like to volunteer please let us know what requirements/restrictions you may have – e.g. You need shade; love the sun; want to be in the woods; love to be in warm-up; can’t walk far; need to be near the porta-potty; etc, etc...... We try to accommodate as many of these as possible! Please feel free to share this post with others that you think may be interested in giving us a hand. This event is always exciting and certainly the place to be if you love horses. We hope you will be able to join us! Horse Trials Volunteers are always needed! If you would like to jump judge for us during the cross country phase; ring steward for dressage or stadium jumping; bit check; keep warm-up running smoothly; scribe; run scores from judges to scorekeepers; help park rigs; build jumps; weedeat or mow at the course; or any other myriad jobs that need filling in order to ensure a successful event - please call Roberta Piercy, 360-929-3607 today! The Concessions stand for this years horse trials is under new management by The Rotary Club of North Whidbey Island Sunrise. And, there are some exciting new dishes and new extended hours! Click here for the new menu and hours of operation. The new hours of operation include being open for business on Thursday night as well. This is a first! ALL PROCEEDS TO BENEFIT ROTARY WATER PROJECT IN HONDURAS.